For computers running identical software, see Monoculture (computer science). For the sociological concept, see Monoculturalism. Monoculture is the agricultural practice of producing or growing a single crop, plant, or livestock species, variety, or breed in a field or farming system at a time. Polyculture, where more than one crop is grown in the same space at the same time, is the alternative to monoculture. Monoculture is widely used in both industrial farming and organic farming and has allowed increased efficiency in planting and harvest. Continuous monoculture, or monocropping, where the same species is grown year after year, can lead to the quicker buildup of pests and diseases, and then rapid spread where a uniform crop is susceptible to a pathogen. Some examples of Monocultures aggressive with the environment are: Monoculture of African Palm Oil, Monoculture of Sugar Cane, Monocultures of Pines, Monoculture of Soybean. The practice has been criticized for its environmental effects and for putting the food supply chain at risk. Diversity can be added both in time, as with a crop rotation or sequence, or in space, with a polyculture. Oligoculture has been suggested to describe a crop rotation of just a few crops, as is practiced by several regions of the world. The term monoculture is frequently applied for other uses to describe any group dominated by a single variety, e.g. social monoculturalism, or in the field of musicology to describe the dominance of the American and British music-industries in Western pop music, or in the field of computer science to describe a group of computers all running identical software. Diversity of crops in space and time; monocultures and polycultures, and rotations of both. The term is used in agriculture and describes the practice of planting the same cultivar over an extended area. Each cultivar has the same standardized planting, maintenance and harvesting requirements resulting in greater yields and lower costs. For example, researchers have discovered a native plant to Senegal, called Guiera senegalensis, grown next to millet increased millet production roughly 900 percent. It also is beneficial because a crop can be tailor-planted for a location that has special problems – like soil salt or drought or a short growing season. When a crop is matched to its well-managed environment, a monoculture can produce higher yields than a polyculture. In the last 40 years, modern practices such as monoculture planting and the use of synthesized fertilizers have reduced the amount of additional land needed to produce food. However, planting the same crop in the same place each year depletes the nutrients from the earth that the plant relies on and leaves soil weak and unable to support healthy plant growth. Because soil structure and quality is so poor, farmers are forced to use chemical fertilizers to encourage plant growth and fruit production. These fertilizers, in turn, disrupt the natural makeup of the soil and contribute further to nutrient depletion. Monocropping also creates the spread of pests and diseases, which have to be treated with yet more chemicals. 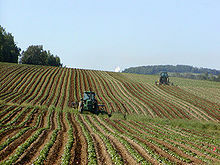 The effects of monocropping on the environment are severe when pesticides and fertilizers make their way into ground water or become airborne, creating pollution. In forestry, monoculture refers to the planting of one species of tree. Monoculture plantings provide greater yields and more efficient harvesting than natural stands of trees. Single-species stands of trees are often the natural way trees grow, but the stands show a diversity in tree sizes, with dead trees mixed with mature and young trees. In forestry, monoculture stands that are planted and harvested as a unit provide limited resources for wildlife that depend on dead trees and openings, since all the trees are the same size; they are most often harvested by clearcutting, which drastically alters the habitat. The mechanical harvesting of trees can compact soils, which can adversely affect understory growth. Single-species planting also causes trees to be more vulnerable when they are infected with a pathogen, or attacked by insects, or affected by adverse environmental conditions. Examples of monoculture include lawns and most fields of wheat or corn. The term is also used where a single breed of farm animal is raised in large-scale concentrated animal feeding operations (CAFOs). In the United States, The Livestock Conservancy was formed to protect nearly 200 endangered livestock breeds from going extinct, largely due to the increased reliance on just a handful of highly specialized breeds. Crops used in agriculture are usually single strains that have been bred[by whom?] for high yield and for resistance to certain common diseases. Given that all plants in a monoculture are genetically similar, if a disease strikes to which they have no resistance, it can destroy entire populations of crops. Polyculture, the mixing of different crops, reduces the likelihood that one or more of the crops will be resistant to any particular pathogen. Studies have shown that planting a mixture of crop strains in the same field can combat disease effectively. Ending monocultures grown under disease conditions by introducing crop diversity has greatly increased yields. In one study in China, the planting of several varieties of rice in the same field increased yields of non-resistant strains by 89% compared to non-resistant strains grown in monoculture, largely because of a dramatic (94%) decrease in the incidence of disease, making pesticides less necessary. As of 2009[update] the wheat leaf-rust fungus occasioned a great deal of worry internationally, having already decimated wheat crops in Uganda and Kenya, and having started to make inroads into Asia as well. Given the very genetically similar strains of much of the world's wheat crops following the Green Revolution, the impacts of such diseases threaten agricultural production worldwide. In Ireland, exclusive use of one variety of potato, the "lumper", led to the Great Famine of 1845-1849. Lumpers provided inexpensive food to feed the Irish masses. Potatoes were propagated vegetatively with little to no genetic variation. When Phytophthora infestans arrived in Ireland from the Americas in 1845, the lumper had no resistance to the disease, leading to the nearly complete failure of the potato crop across Ireland. Had the farmers used multiple varieties of potato, the famine might not have occurred. Many of today's livestock production systems rely on just a handful of highly specialized breeds. Focusing heavily on a single trait (output) may come at the expense of other desirable traits - such as fertility, resistance to disease, vigor, and mothering instincts. In the early 1990s a few Holstein calves were observed to grow poorly and died in the first 6 months of life. They were all found to be homozygous for a mutation in the gene that caused Bovine Leukocyte Adhesion Deficiency. This mutation was found at a high frequency in Holstein populations worldwide. (15% among bulls in the US, 10% in Germany, and 16% in Japan.) Researchers studying the pedigrees of affected and carrier animals tracked the source of the mutation to a single bull that was widely used in the industry. Note that in 1990 there were approximately 4 million Holstein cattle in the US, making the affected population around 600,000 animals. Humans rely heavily on a relatively small number of food crops and farm animals for food. If disease hits a major food crop - as happened during the 19th-century Irish potato famine - food supplies for large populations could come under threat. Maintaining and increasing biodiversity in agriculture could help safeguard world food-supplies. Monocultural land-use can have effects at the level of society. Seasonal peaks in harvesting activity can place demands on labor availability. The environmental movement seeks to change popular culture by redefining the "perfect lawn" to be something other than a turf monoculture, and seeks agricultural policy that provides greater encouragement for more diverse cropping systems. Local food systems may also encourage growing multiple species and a wide variety of crops at the same time and same place. Heirloom gardening and raising heritage livestock breeds have come about largely as a reaction against monocultures in agriculture. ^ Connor, David J.; Loomis, Robert S.; Cassman, Kenneth G. (28 April 2011). Crop Ecology. ISBN 9781139500326. ^ "Crop Science - ICSC2004". ^ Leech, Garry. "The Oil Palm Industry: A Blight on Afro-Colombia". NACLA Report on the Americas. doi:10.1080/10714839.2009.11725459. ^ Correa-García, Esteban (Summer 2018). "Territorial transformations produced by the sugarcane agroindustry in the ethnic communities of López Adentro and El Tiple, Colombia". Land Use Policy. doi:10.1016/j.landusepol.2018.03.026. ^ Cordero, Adolfo. "Large scale eucalypt plantations associated to increased fire risk". PeerJ Preprints. doi:10.7287/peerj.preprints.3348v1. ^ Vieira, I; et al. "Deforestation and threats to the biodiversity of Amazonia". Brazilian Journal of Biology. doi:10.1590/S1519-69842008000500004. ^ "Denison, R.: Darwinian Agriculture: How Understanding Evolution Can Improve Agriculture. (eBook and Hardcover)". ^ "Ecological Theories, Meta-Analysis, and the Benefits of Monocultures". Retrieved 18 September 2015. ^ Cardinale, Bradley J.; Matulich, Kristin L.; Hooper, David U.; Byrnes, Jarrett E.; Duffy, Emmett; Gamfeldt, Lars; Balvanera, Patricia; O’Connor, Mary I.; Gonzalez, Andrew (1 March 2011). "The functional role of producer diversity in ecosystems". American Journal of Botany. 98 (3): 572–592. doi:10.3732/ajb.1000364. ISSN 0002-9122. PMID 21613148. ^ G. Tyler Miller; Scott Spoolman (24 September 2008). Living in the Environment: Principles, Connections, and Solutions. Cengage Learning. pp. 279–. ISBN 978-0-495-55671-8. Retrieved 7 September 2010. ^ a b Haspel, Tamar (9 May 2014). "Monocrops: They're a problem, but farmers aren't the ones who can solve it". New York Times. Retrieved 12 January 2016. ^ Richardson, David M., ed. (2000). Ecology and biogeography of Pinus. Cambridge, U.K. p. 371. ISBN 978-0-521-78910-3. ^ Zhu, Youyong (June 2000). "Genetic diversity and disease control in rice". International Weekly Journal of Science. 406: 718–722. Retrieved 21 March 2019. ^ "Genetic Diversity and Disease Control in Rice". Archived from the original on 18 November 2011. ^ Vidal, John (19 March 2009). "'Stem rust' fungus threatens global wheat harvest". The Guardian. London. Retrieved 13 May 2010. ^ Williams, J.L. (22 October 2015). "The Value of Genome Mapping for the Genetic Conservation of Cattle". The Food and Agriculture Organization of the United Nations. Rome. Retrieved 22 October 2015. ^ Monoculture in Agriculture: Extent, Causes, and Problems-report of the Task Force on Spatial Heterogeneity in Agricultural Landscapes and Enterprises. United States. Department of Agriculture. 1973. p. 32. Retrieved 24 May 2018. Under monoculture, the human population tends to be sparser than under mixed agriculture [...]. The sociological imbalance of monoculture has been amplified by the type of technology adopted. ^ Compare: Monoculture in Agriculture: Extent, Causes, and Problems-report of the Task Force on Spatial Heterogeneity in Agricultural Landscapes and Enterprises. United States. Department of Agriculture. 1973. p. 32. Retrieved 24 May 2018. Sometimes seasonal demands for labor can be coordinated between two crops or with nonagricultural activity in the area. Look up monoculture in Wiktionary, the free dictionary.